We would all like that we could stop aging, at least for a few years. Unfortunately, nature has not given us the power and as time goes on more wrinkles appear while our skin becomes gaunt, damaged by erosion over the past years. This is particularly true after 35 years of age. But age does not bring only wrinkles, but poor cognitive functions, concentration becomes difficult, memory fails us, we cannot run as before, some movements cause pain, etc. Although there is no magic pill, aging of the face and body as a whole can still be slowed down. Fresh fruits and vegetables, cocoa, seeds and nuts will help you preserve your youth. Some will say that it must be so, aging is inevitable and miraculous pills to slow down this process are not existent. However, no matter how strange it may sound, you can’t cheat your age. No matter if you feel younger and look younger your ID card and birth certificate will always say the right age. No, the key is not in liposuction or Botox, which tightens the skin, and often steals the natural smile. The secret to anti-aging is a healthy lifestyle and, of course, a healthy diet, which will speed up digestion, alleviate inflammation and hormonal imbalances, preventing oxidative stress, and restoring normal pH of the body. What are the most common mistakes that accelerate the aging process? Stress greatly contributes to faster aging. If you work a lot, if you are dissatisfied with work or life in general, be sure to give yourself a little more time to rest. Steal some time for friends and laugh, or take a free yoga classes of laughter. Instead of the car or public transport, go to work by bicycle or on foot, and then give yourself a daily dose of necessary physical activity. On the other hand, if you carry cigarettes with you and you cannot imagine your day without it, try to give up smoking - it accelerates aging of the skin, but also endangers the health of the whole organism. Instead of a cup of coffee or a cup of iced soda, drink a cup of hot tea, but before you throw candy vending machine candy bar, consider a good opportunity to bite an apple or a handful of red berries instead. If you persistently look for a solution to stop the aging of the skin, the first thing to do is to remove from your diet refined white sugar and table salt. They are first on the list of foods that you should forget if you want to outwit the years. A large amount of sugar prevents the regenerative processes in the body and thus accelerates skin aging, and in the various cases causes inflammation, hormonal disorders, freckles, wrinkles and tooth decay. When your body is crying out for fresh food, indulge it by eating beets, carrots, tomatoes, sweet potatoes, a little almond or pistachio. On the other hand, excessive salt intake disturbs the balance of potassium and sodium in the body, which can cause nausea and various kinds of inflammation. Therefore, instead of a regular kitchen salt use Himalayan salt - which is valid for the healthiest in the world, since it contains about 80 useful minerals and nutrients - or unrefined sea salt. Cow's milk also is not recommended, because it can be difficult to digest and disrupt hormone levels. You can replace it with sheep or goat milk, or the coconut or almond milk. Do not worry about calcium - you can enter it into the body by eating green leafy vegetables, nuts and whole grains. Replace red meat with chicken or turkey meat, and avoid animal fats, especially trans fats, which are industrial and processed foods (fast foods, processed meats, sweets ...) and contribute to premature aging of the skin. Dishes can be spiced up with ginger and turmeric, and cold pressed vegetable oils, which also contribute to slower aging of skin. Unlike cow's milk, yogurt should be included in the diet. In addition to being an excellent source of protein and B vitamins, which preserves the memory and keeps the brain, yogurt is rich in calcium, which strengthens bones and protects teeth and gums. In addition to yogurt, fish is rich in calcium, except that it contains a very useful omega-3 fats. For healthy bones and prevent osteoporosis, it is very important to enter magnesium into the body, which keeps the function of muscles and nerves, affecting the proper functioning of the heart, strengthens the immune system and relieves stress. It is found in bananas, spinach, rice, beans. If you are afraid that the Alzheimer's over the years could knock on your door, especially if there are cases in the family be sure to eat red berries. 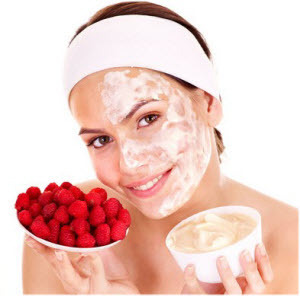 Strawberries, currants, blueberries, blackberries and raspberries prevent the aging process in all fields - are rich in powerful antioxidants, which protect cells from damage, strengthen the immune system, but also contribute to healthy skin. On the other hand, cacao stimulates blood circulation in the brain responsible for learning and memory, and since it acts as an antioxidant it slows down aging of the skin and at the same time of the whole body. The good news for aficionados is that you can eat dark chocolate - while most chocolates on the shelves in supermarkets are full of sugar and harmful to the whole body, dark chocolate is rich in flavonols, and keeps the skin and relieves stress, which is one of the triggers for the accelerated aging process. Hemp, pumpkin, flax, sesame, sunflower seeds ... whichever you chose - you will not go wrong. Seeds rejuvenate the brain and blood vessels, and also strengthens the skin, nails, hair and bones. Some of them you can add to rolls and other dishes, flax seed and yogurt are the ideal snack, while others are perfect when you want something to chew on - pumpkin and sunflower seeds usually are unavoidable when watching sports matches it calms the nerves of die-hard fans. Nuts are the real sources of energy - rich in vitamins, minerals and omega-3 fatty acids. Strengthen the memory and concentration, and have a beneficial effect on skin, hair and nails. If your skin is exposed to smoke or harmful UV rays, walnuts, almonds and hazelnuts rehabilitate the damage to its cells, and provide it with enough moisture. Also, if you regularly consume these beneficial foods, you will not only slow down the aging of the face, but you will also reduce the risk of stroke, and heart disease. Keep skin and green leafy vegetables, pumpkin, watermelon, pomegranate, red grapes, green tea and celery, which prevents it from drying and flaking. On the skin of some people with years of age spots appear. If you have this problem, be sure to include coconut oil in your diet, which protects the body from various infections and inflammation, hydrates the skin and makes it soft, and besides - strengthens the hair. The oil from coconut can be used as a substitute for other types of oils in the kitchen, but not for olive oil, which also has a very beneficial effect on the skin - protects the structure of its cells, slows aging and rehabilitate the damage caused by free radicals. In addition, it reduces the levels of bad cholesterol in the blood and protects the heart and blood vessels. In a blender mix half a beetroot, five leaves of fresh green salad, an apple and half a teaspoon of minced fresh ginger root. Add the juice of one fresh squeezed lemon medium size. If desired, insert a little mint and ice. Drink immediately. Place in a blender half a cup of strawberries, a cup of blueberries, half a cup of chopped beets and cabbage leaves. Mix depending on the desired density, add water. Most often add one cup. Drink immediately after mixing, and optionally add an ice cube. Two cups of fresh blueberries mix in a blender with two chopped apples. Drink immediately, with the addition of ice if desired. Cut a larger cucumber (wash it, but not peel), two carrots, two apples and celery, and mix everything in a blender. The beverage is best to drink immediately. Ingredients: one green salad, 5 cherry tomatoes, two cucumbers, one green pepper, one red pepper, one zucchini, 2 tomatoes, 2 onions, 1 tablespoon of cumin, 2 tablespoons of lemon juice, 1/2 a cup of olive oil, 5 tablespoons of Ribella hummus (see Healthy foods), 500 g of cooked chickpeas, 4 cloves of garlic, a teaspoon of salt, half a teaspoon of pepper, 2 teaspoons of drought. Preparation: Finely chop all the ingredients and mix them. For the dressing use lemon juice, cumin, olive oil and Ribella hummus a little salt and pepper to taste. Stuffed vegetables with Ribella hummus slows skin aging. Ingredients: 3 cherry tomatoes, 1 cucumber, 4 tablespoons of Ribella natural hummus. Preparation: Wash vegetables well, then carve with a small knife, first cut off the top, and then with a teaspoon remove the middle. Turn the tomatoes upside down to drain the excess water. Thus prepared cucumber and tomato fill with humus. Leave for a while in the fridge before serving. We hope that you learned how to slow down the aging of the face. If you have any good recipe, feel free to place it in the comments.